Having a beautiful home c/w a lush garden or even a small garden where you spend a lot of time, home owner may want to consider installing garden sound system but not sure how to start. Out door sound system is a very relaxing way to listening to music while tending to your plants, just lazing in the garden or patio and even attending to your KOI fishes in the garden pond and entertaining guest in the garden party. SECURITEX-TOA GS-302 outdoor speakers are made exactly to give you that kind of listening pleasure yet it blend extremely well with the garden surroundings. Once installed you'll never know there's a speaker in the garden until you hear it play music or song its like music and song coming from everywhere. Installing outdoor speakers in the garden is trickier than what most people think especially if the wrong speakers are chosen but with SECURITEX-TOA GS-302 you can never go wrong. Speakers cabling although some digging will be required to bury the speaker cables and it may be necessary to route this cable around or beneath obstacles, such as concrete walkways or raised garden beds and also to bring this cable to the amplifiers and the CD player etc home owner can also chose to have the cable neatly laid in the garden hidden within the grass and plants for easy relocation of the speakers. SECURITEX ELECTRONIC SYSTEMS ENGINEERING is able to assist home owner to designed and configured a Garden Sound System to meet your garden size, be it a 20 sq ft garden or 2000 sq ft garden we have the exact system for you. 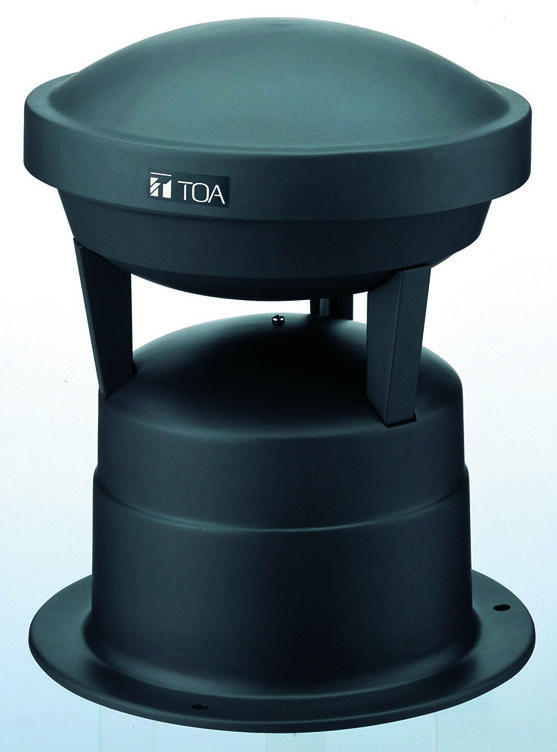 The TOA GS-302 is also very good for Back Ground Music (BGM) application. The speakers can be use to play back ground music, songs and even to be use with the public address system for broadcasting etc in huge open area like public park. We only use SECURITEX-TOA Music System equipment for background and foreground to designed, supply and install for our client as this sound system has been tested to be extremely reliable and heavy duty in the harsh garden setting where its usually damn, wet and some time hot etc. The SECURITEX-TOA GS-302 outdoor speakers are built to satisfy the requirement for stylish and attractive designed that can be installed in a variety of demanding environment that pose considerable difficulties for conventional speakers. The SECURITEX-TOA GS-302 offer a very highly reliable performance that also fully satisfy the IPX4 requirements for environment with exposure to water. This speakers can be install in Botanic Gardens, Zoo, Public Parks, Nature reserve and of course home garden. 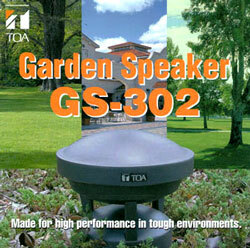 The GS-302 Garden Speaker is a compact speaker that is ideal for applications such as paging and background music broadcasting in various locations such as gardens, theme parks, resort facilities and others. The exterior is formed of corrosion-resistant material that gives it an extended service life in adverse environments (IPX4 category). The Garden Speakers inconspicuous design enables it to be easily installed in the middle of garden shrubbery and virtually disappear into the surroundings. Speakers Material ● Speaker enclosure composed of FRP resin (Fibre-Reinforced Plastic (FRP) (also fibre-reinforced polymer) is a composite material made of a polymer matrix reinforced with fibres. FRPs are commonly used in the aerospace, automotive, marine, and construction industries. provides exceptional resistance to corrosion and moisture, making it ideal for installations outdoors. Speakers Cabling ● Speaker wiring and the base unit may be buried in the ground. The unobtrusive design allows it to easily blend into the surroundings. The speaker can also be positioned in garden shrubbery. High Impedance ● The GS-302 is designed exclusively for high impedance applications and is easily incorporated into a distributed network covering a larger area. 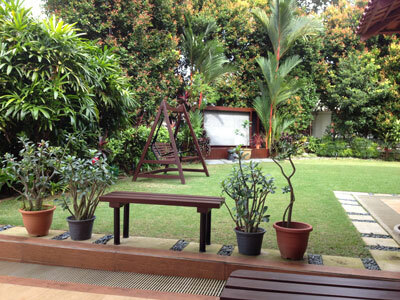 Home owner who likes to install such a system but will like to hear the sound and look at the speakers, system and the installation in real setting can contact Mr. David Tan for an appointment to view the setup in a home garden environment. We welcome home owner to bring along their own Music CD to play in the system to appreciate and enjoy the system. The demo will be in a garden setting instead of the showroom so that home owner can experience first hand how the garden sound system perform in the garden.